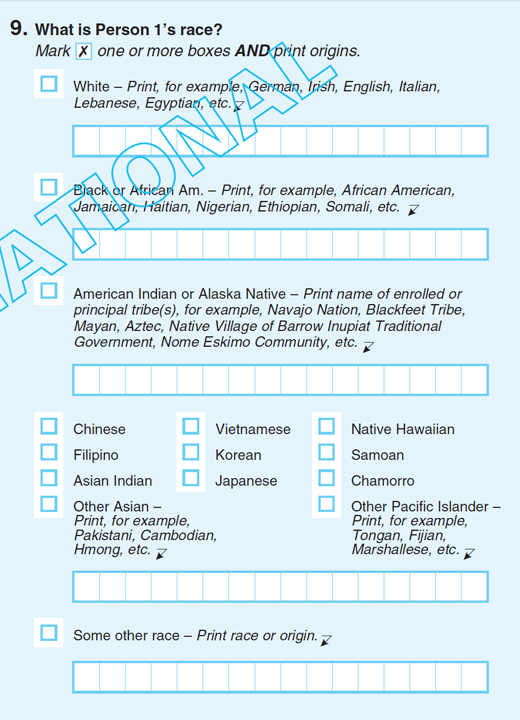 A sample form that includes a write-in category for those who check "White" on the race category in the upcoming 2020 Census. American citizens who check “White” on the U.S. Census will be allowed to expand on their ethnicity for the first time in the upcoming 2020 census. In an effort to establish a more comprehensive understanding of American heritage, the Census Bureau has announced the addition of a write-in box in which citizens can fill out their origins and cultural associations more precisely. The change is being made in response to a nationwide “call for more detailed, disaggregated data for our diverse American experiences as German, Mexican, Korean, Jamaican, and myriad other identities,” according to the bureau’s recent Race and Ethnicity Analysis Report. There will be a similar write-in option for the “Black and African American” category as well. View the entire document with DocumentCloud via NPR. The first time I filled out a census form in the U.S. was in the spring of 1960 at Parris Island, S.C., when I was a Marine Corps recruit. one caption required a non-citizen to show to indicate his country of citizenship and to be precise if one came from West or East Germany, Northern or Southern Ireland. I simply wrote IRELAND in the box because my nationality applies to an náisiún uile agus gach roinn de. (the whole nation and all its parts.